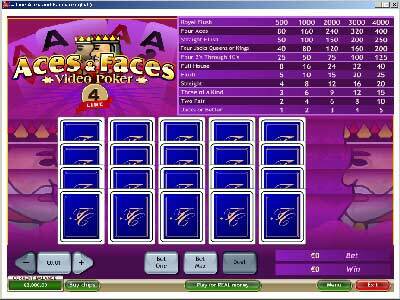 The object of 4-Line Aces & Faces is to obtain a five-card poker hand that contains a winning combination. It differs from original Aces & Faces, since it has four lines of cards. Each line uses a different deck of cards. Each line is treated as a separate hand for the determination of any wins. · Choose the value of the coins you wish to wager each round, by clicking on the + and – buttons on the right of the screen. · Click Bet One or Bet Max to select the number of coins you wish to wager. Each click on the Bet One button increases your bet per line by the value of the coin you selected. Pressing Bet Max increases your bet to the maximum amount possible – that is five coins per line – and deals the cards automatically. You can also click the appropriate column on the paytable to specify the number of coins per line. The bet size you choose is per one line. Since there are four lines of cards, four times the single line bet amount is subtracted from your account balance. Your total bet amount is shown in the lower right corner of the screen, after the label “Bet”. · Click Deal (if you did not press Bet Max). · Choose which cards you wish to keep by pressing the Hold button underneath the card, or by clicking on the card itself. Held cards are used across all four lines of cards. 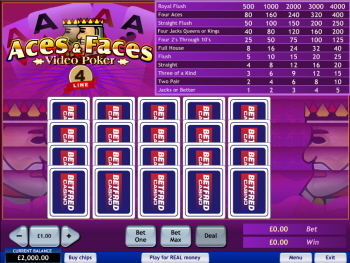 An auto-hold feature exists for this game whereby cards that make up a winning hand on the initial deal are automatically held for the player. · Click Deal to replace the cards that you did not choose to hold. After the cards have been replaced, your cards are checked for any winning combinations, described in the paytable (click the Paytable button to see it, click it again to close it). · If you have winning hands on multiple lines, your winnings are added together. · The lowest winning combination is a pair of Jacks: a pair of any lower cards (for example, Tens) is not a winning combination; a pair of any higher cards (for example, Queens) is a winning combination. If you end up with a winning hand, you can accept the win (press Collect), or you have the option to Double it. Should you choose to Double, the dealer draws an open card and you are given 4 unexposed cards to choose between. If you choose a card that is lower than the dealer's, you lose your original win. If the cards are equal, it is a tie, and you have the option to collect your original winnings (press Collect) or Double again. If your card is higher, you win double the amount of your original winnings. You then have the option to collect your winnings or Double even further. You can also choose to Half Double, which means you only double for a half of your winning amount with the remainder being awarded to your account balance. You cannot Double or Half Double, if your winning amount exceeds 2000. You can move the Double window (if enabled from the Options section) by dragging it with the mouse. Doubling is a separate game round, and can be viewed as such in the Game History. During doubling the Bet meter displays the amount wagered for doubling: the full or half of the previous round’s win amount. The Win meter displays the win amount of the current round.